That provides a lot of casting leeway. Barbra Streisand was only 25 when she starred in the movie. Betty Buckley, now on tour with the recent Broadway revival at age 71, is a couple years younger than Bette Midler, who won a 2017 Tony for her performance in Jerry Zaks’ delicious revival. Broadway wags, however, have the best answer to this musical theater mystery. How old is Dolly Gallagher Levi? Whatever age Carol Channing happens to be at the time. Channing, who died Tuesday at her home in Rancho Mirage at age 97, was the original and for many the only Dolly. The actress’ unique combination of qualities — the gawky glamour, the loony seductiveness, the killer comic timing — found a welcoming home in the role of the fast-talking New York widow, a matchmaker with a business card for every occasion. One of a kind, Channing was a like a cross between Marilyn Monroe and Gracie Allen, with a personality voice that could make a tune completely her own. When she sang, pixie dust shot into the air. She was an Al Hirschfeld cartoon sprung into swooning life. Broadway fell in love with Channing as Lorelei in the 1949 musical “Gentlemen Prefer Blondes.” One song from the show, “Diamonds Are a Girl’s Best Friend,” became her signature number. She was one of the few actresses who could make avarice adorable and gold-digging seem sweetly innocent. Some doubted after “Gentlemen Prefer Blondes” whether Channing would ever find a role that would allow her to dazzle as daffily as Lorelei. She wasn’t the first choice for Jerry Herman and Michael Stewart’s new show “Hello, Dolly!” Producer David Merrick went to Ethel Merman and Mary Martin before eventually offering the role to Channing. She was in good hands with director and choreographer Gower Champion, who helped launch her career in the 1948 revue “Lend an Ear.” Dolly is a comic confection with genuine feelings; her zaniness conceals a soul. For all Channing’s artificiality, she was always giddily and gorgeously human. Farcical fun was her strong suit, but she wouldn’t let the parade pass her by without feeling the ephemeral beauty of what she saw. Merman and Martin, no doubt inspired by what they saw, eagerly signed up for “Hello, Dolly!” tour of duties. No one could claim a monopoly on a show that will always be with us, but whenever Channing stepped back into the role, audiences were there to appreciate the magical confluence. In her last tour, she was in her mid-70s. So what? 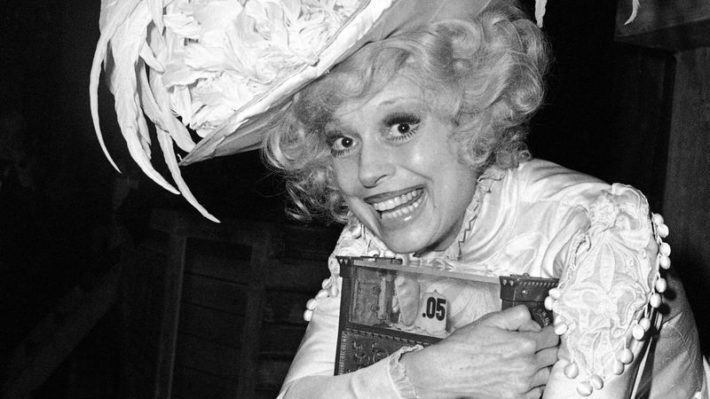 Dolly Levi is a woman of uncertain age, and Carol Channing was a Dolly for all seasons.